November. 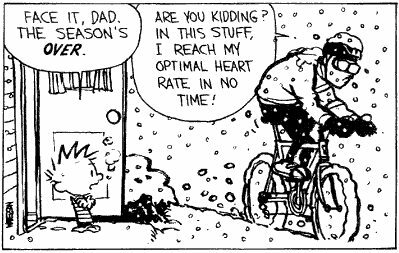 In most parts of the country, most folks are thinking that it’s time to bring the bicycle into the house and set up the trainer in front of the TV for some nice warm winter riding…indoors! Well, it turns out that a lot of folks prefer to continue keeping their bicycling adventures outdoors. According to some cyclists, it’s never too cold…wet…dark…windy (fill in the blank!) outside! It’s simply a matter of being properly prepared. Gotta love the enthusiasm! So here goes…a few important pointers for those of you folks who want to keep it outside! Dress for the weather. When it’s cold outside, layering your clothing is the best way to deal with cold and wet conditions that are likely to change quickly. Three layers are ideal: a base wicking layer that will help keep moisture from your skin (wool is your friend! ); a second layer that acts as the insulating one (fleece, down, wool, etc…); and a third layer which is your outer shell. This should block the wind and be water-resistant (Gore-Tex type material). This layer should also be breathable so it allows perspiration to escape so you’ll remain dry. When it gets below zero, please keep in mind that cycling speeds will generate enough wind chill to cause frostbite, so if any part of your face feels cold or numb, stop and warm it up. Pay special attention to your hands and feet. Try a variety of booties, gloves, arm, knee and leg warmers. It’s important that these be waterproof and windproof. Also use a skullcap or balaclava underneath your helmet. On top of the appropriate clothing for winter cycling, it’s also important to wear reflective gear. Cyclists should wear a reflective vest and also should add reflective strips to their knees and ankles so their pedaling movement will also be seen by drivers. Clear/white reflectors return twice as much light as amber ones and more than three times as much light as red ones. Your choice of bicycle is important. Decide on which bike you feel more stable. When the roads are covered with snow and/or ice, you may feel more stability on a hybrid or mountain bike than you would on your road bike. Studded tires can also give you more traction. Flashers are also effective and are best mounted on your bike or rear rack where they can be precisely aimed. Many people install more than one rear flasher. -Ride in the direction of traffic. -Obey all traffic signals including stop signs and lights. -Travel as far to the right in the travel lane as practicable. -Utilize turn lanes when available. -Maintain as straight a line of travel as possible. -Be alert when riding in traffic. -Ride with confidence and make eye contact with other road users. Food. Your body is going to have to work harder than usual to maintain its core temperature, even with all of the appropriate winter clothing. It’s important to eat enough to have adequate calories to handle this additional energy expenditure. It’s also just as important to maintain adequate hydration during the winter months as it is during the summer. Because winter brings sloppy and ever-changing conditions, your bike is going to be subjected to snow, ice, salt and sand. Check your chains often and think about adding fenders to help direct water away from your bike. 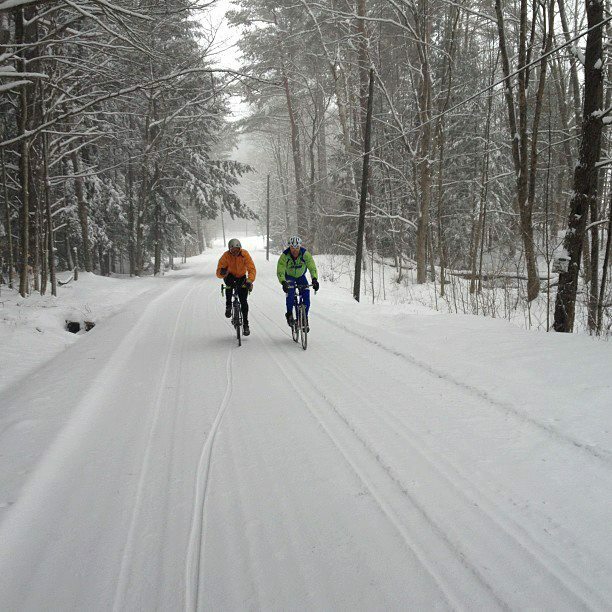 There’s a start to some comfortable and rewarding winter cycling! Enjoy! Image | This entry was posted in Vermont Bicycle Tours and tagged adventure, bicycle, bicycle tours, bicycling, bike, bike touring, biking, Business, Clothing, Cold-weather biking, cycling, Discovery Bicycle Tours, Gore-Tex, inn-to-inn bicycle tours, Lane, Maine, OUTDOOR ADVENTURE, vermont, winter, winter cycling. Bookmark the permalink.